Solomon Burke was a highly influential and successful American soul singer. 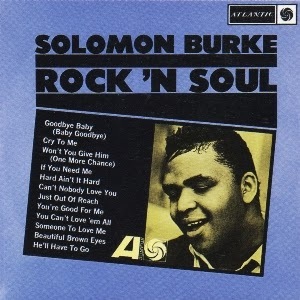 The years 1961 to 1963 had been Solomon Burke's breakthrough years, as he signed with Atlantic Records and scored hits with "Just Out Of Reach (Of My Two Empty Arms)", "Cry To Me", "I'm Hanging Up My Heart For You" and "If You Need Me", followed by the If You Need Me album. The hits kept on coming. Next was "You're Good For Me", written by Don Covay, which charted at #8 R&B. Through 1964 the R&B chart was temporarily discontinued, but his singles were getting onto the national pop chart anyway, the highest charting release of the year being "Goodbye Baby", which reached #33. Other singles which reached the pop chart in 1964 were "Everybody Needs Somebody To Love" (#58), "The Price" (#57) and "He'll Have To Go" (#51). The latter was another country cover, originally having been a big hit for Jim Reeves back in 1960. By the end of the year he was without a doubt Atlantic's biggest R&B star, and at the height of his success was crowned 'King Of Rock & Soul' with an on-stage ceremony, after which he took to wearing a crown and cape when performing. His second Atlantic LP came out the same year. It was pretty much a compilation album, bringing together most of (but not all of) his recent hits. Alongside "You're Good For Me", "Goodbye Baby" and "He'll Have To Go", it also included some of his hits the previous few years ("Just Out Of Reach", "Cry To Me", and "If You Need Me"). It just stopped short of being a complete collection of all of his Atlantic hits. Between the well-known songs were some equally strong album tracks, including a surprising cover of Woody Guthrie's "Hard, Ain't It Hard". It made for an excellent and diverse album, mixing different strains of R&B, gospel, pop and country to make up the distinctive soul sound of Solomon Burke. wow, that really hits the spot!